I’m pretty sure that everyone has a favourite Super Mario Character. I think that if I could only pick one, that dry bones would be it. He looks cool, and has a get back up and try to kill the hero again attitude. Deviant art user ClayPita has brought a bunch of Mario characters to life, and they all look crazy good. You can see their entire gallery here. 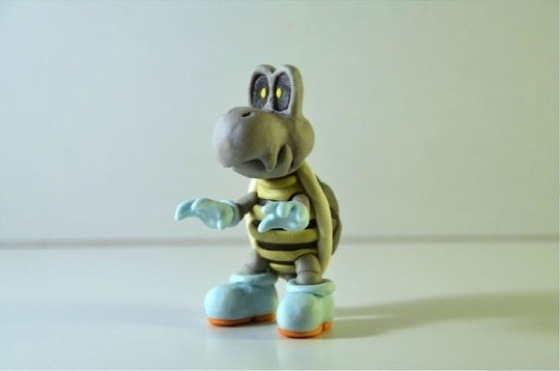 You thought that Koopa Troopa was dead? Well yes, it is, but that won’t stop him from attacking you! These things can be really dangerous as you can’t kill them because, well, they’ve already been killed. you can only smash them and they’ll fall apart, but some moments later they’ll reassemble and go on like nothing happened. And if they do that on small platforms or in large numbers it gets…frightening. But I like Dry Bones nevertheless. I think they’re cute even though they’re also a little bit creepy. And I love the sounds they make. So adorable! I do not own Dry Bones. But I wouldn’t know what to feed it anyway. You know, besides humans.